Susan’s greatest fear had become a reality. Allen, one of her best people, was leaving. There’s no easy answers when you lose a good person. The best thing you can do is prevent it from ever happening. No matter the size or type of company you work at, you as a manager have a great tool you can use to prevent issues like this from ever happening. It’s having effective 1 on 1 meetings with everyone on your team. There’s no better way to ensure open lines of communication, fix problems, and retain your people. 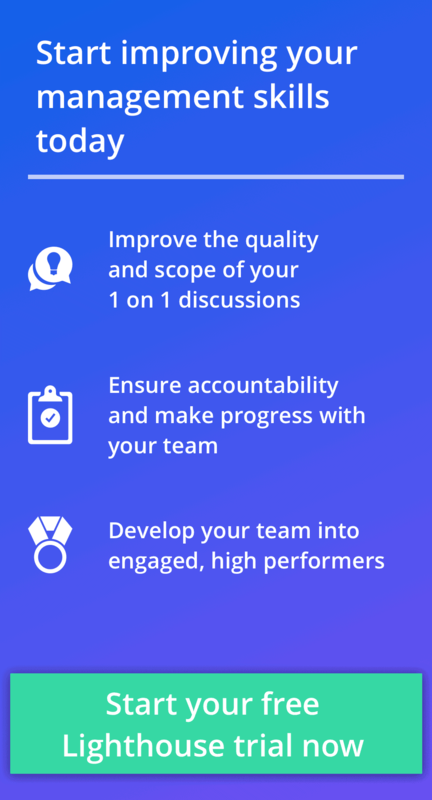 To help leaders like you, we recently had a webinar showcasing all the best practices and research that can help you have amazing 1 on 1 meetings with your team. By learning from great leaders like Andy Grove and Ben Horowitz, and applying the latest workplace research from universities like Stanford and Harvard, you can ensure all your people stay for a long time, and have solid working relationships. Check out the video recording and slides below to learn more. If you have a follow up question, leave a comment and we’ll answer so everyone benefits. Whether you’re a grizzled, veteran manager, or a total newcomer to leading others, this webinar can help you make the most of these meetings. It also gives you tips you can apply to solving key problems you may be dealing with on your team. Big companies have a number of advantages: high pay, clear career paths, and standard reporting structures/hierarchy. So what do you do if you’re leading or managing in a small organization? Here’s a few questions from the audience in the webinar. A: Your best bet is to share the responsibility. Rather than doing a poor job with 15, get help so you and someone else can do awesome 1 on 1 meetings for everyone. That’s why the best practice is for teams no larger than 7 to 10 team members. Read more on developing leaders as your team grows here. Q: “What if I work in a very small company where career progression is limited. 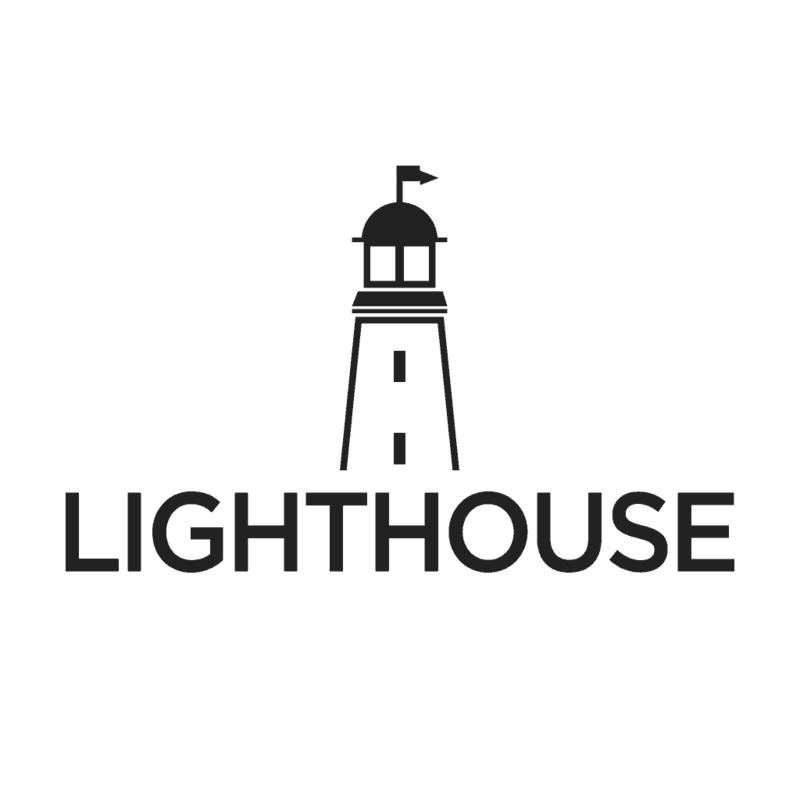 How can I help with career development? A: While promotions and moving up the job title ladder are good growth options, they’re not the only ones. Look for side projects you can get people involved in that they’re excited about, and help them grow within their existing roles. That’s just 2 of the many ways you can grow your people without promotions (read more here). If you’re spending a lot of time coaching up your underperformers or mentoring younger employees, you may overlook your stars. Here’s a couple of the challenges managers told us they had trouble with their best people. A: As Peter Drucker said, “starve problems and feed opportunities.” Your best people are opportunities. Use your 1 on 1 meetings to help them continue growing. If they keep knocking out challenges then you can always channel more of their drive into big goals. Get their feedback and buy in on big changes, too. They’re likely to have insights that can make much of your efforts more successful. A: It can be intimidating to manage someone that’s super sharp and more knowledgeable than you in a key area. Be humble. Don’t let your ego stop you from have great 1 on 1 meetings with them. Bring good questions to your 1 on 1s and let them teach you a few things. They’ll be grateful you’re willing to listen to their ideas. These questions for 1 on 1s with individual contributors and these questions for 1 on 1s with a manager can help you spark great discussions. A: Humility and persistence are a manager’s best friends. If you started on the wrong foot with them, confront it. You can often diffuse a situation by starting out by apologizing. It then makes it safe for them to admit mistakes, too. This post gives you a step by step guide to turn things around if your team doesn’t like you anymore. A: If any employee is combative, there’s probably a good reason. Try to find out why they’re upset and try to help make the situation better. Are they frustrated by something? Are they made at you? Whatever it is, show them some empathy and really listen. Even small changes can make them feel better and thaw a frosty relationship. A: The best thing you can do as a leader is make the most of the time that you have. You may not be able to guide their career for the next 5 years, but you can help them grow while you are there: Buy them a book, get them involved on a project that will help them learn/grow, introduce them to someone that can mentor them. Even small efforts can have a big impact for people that have a lasting impact no matter how brief your time managing them. A: As a former product manager, I love this question! Great product managers have peer one on ones with many of their colleagues they work with. If you manage a product manager, encourage them to have them. Then, use your one on one meetings to find out the other things they’re learning in those meetings. You may be surprised the insights on morale, productivity, and other issues they’ll have. 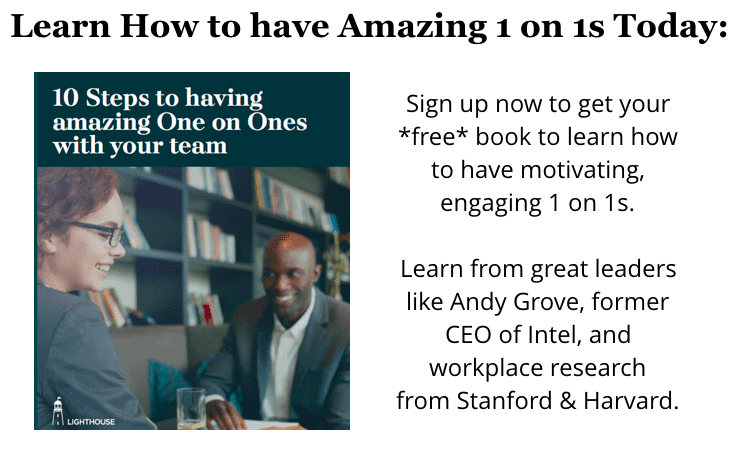 Ready to start having awesome 1 on 1 meetings? Clearly, a lot goes into making your 1 on 1 meetings awesome. However, you do not have to go it alone.